If you're looking to try a new, healthy snack, Starbucks is the place to be on Friday, February 5. Customers can sample one of two KIND Fruit + Nut bars at Starbucks across the country, choosing between Cranberry and Fruit & Nut Delight. If you're unfamiliar with KIND bars, they're all-natural fruit and nut bars with no refined sugars, and they happen to be delicious. To learn more about KIND Healthy Snacks, visit www.kindsnacks.com. Update: It's now February 5 and my local Starbucks does not have the samples! Truth is, they haven't received them yet. But when they do, they won't be full-sized bars, there will just be some cut-up samples available when you walk in. Oh well, it was worth a try. As I sat here drinking my giant cup of home-brewed coffee this morning, I got an e-mail that made me want to jump out of my chair, call a friend, and meet at Peet's. One of my favorite coupons has returned to Peet's Coffee & Tea: Enjoy 1 beverage when you buy 1 beverage for a friend. Yippee! The free drink must be of equal or lesser value, with the only exclusions being juice, kids drinks, and bottled beverages. And you won't be able to use your coupon at a BART, airport, or supermarket. The coupon can be printed from your computer, or shown on your mobile device (love this eco-friendly option! ), through Wednesday, February 3. Any smart company knows that customers like being rewarded. As it turns out, Reese's is very smart this week. The Hershey's Pieces Wrapper Rewards Program rolled out yesterday, with a special plan for fans of Reese's on Facebook. They're giving away coupons for free bags of Pieces candy to the first 25,000 people who send in an empty wrapper and rebate form. Customers will need to download a form to mail in along with a UPC from an Almond Joy, York, Special Dark or Reese's candy bar. Hershey's will respond to the first 25,000 with a coupon for a free bag of Pieces candies, valued at $3.69. Choose from Reese's Pieces, Almond Joy Pieces, Hershey's Special Dark Pieces, and York Pieces. This offer takes place through February 10, or while supplies last. Thanks to Bargain Briana for tweeting about this deal! This weekend isn't a holiday weekend, but it might as well be. Betsey Johnson is slashing prices by an additional 40% off already-reduced clothing and 25% already-reduced handbags. The sale takes place in stores and online from Thursday, January 28 through Monday, February 1. All purchases are final and outlet stores are not included. Unfortunately, neither is jewelry. At least the jewelry markdowns are generous enough as they are. This Houndstooth Charmeuse Ruched dress immediately caught my eye. At a sale price of $179, marked down from $358, I must have it. After the additional 40% markdown, the final price will be $107.40. I'm calling my local Betsey Johnson first thing in the morning with my fingers and toes crossed. No coupon is necessary, just show up online or in a local store and save! The savings will be automatically applied at checkout. Today is a very special day. Why? Oreo is giving away free cookies! Thanks to the Manning Brothers beating Donald Trump in the Oreo DSRL Lick Competition, we get free Oreos. Don't ask. Or, just watch the commercial on YouTube. Oreo is giving away 150,000 free packages of Golden Double Stuf Oreos on Monday, January 25. The giveaway takes place on Oreo's Facebook page, starting at 3pm EST and ending at midnight. You'll need to become a fan and fill out a form to receive your coupon by mail. The offer will be replaced with a $1 off coupon once all 150,000 freebie coupons are gone. And if you need something to dip them in, grab a free gallon of milk from the Great Gallon Give while you're at it. Thanks for Sweeties Swag for sharing this freebie! We all know that milk does a body good. And free does a budget good. So, how about some free milk? Introducing the Great Gallon Give, a contest to win free milk for a year. That's 52 coupons for 1 gallon of milk, valued at up to $4 per gallon. Bring on the organic! The best part is, when you enter this contest, you'll receive a coupon for a free gallon of milk, just for entering. You can use the coupon at any store with purchase. This offer is limited to one per household. You can play once per day, but you'll only receive one milk coupon the first time you play. Make sure you're hooked up to your printer, because you won't be able to save a PDF to your desktop and you only get one chance to print. There will be 120 winners total, so chances are pretty good. Play the Great Gallon Give, for a free gallon of milk, and a chance to win 52 gallons! Let me guess. One of your New Year's resolutions was to eat healthier, right? I knew it. Kashi is well aware of that too, and wants to make it easier on you with a free sample of Kashi cereal bars. Choose from GOLEAN Crisp! Toasted Berry Crumble cereal bar, TLC Dark Chocolate Coconut Fruit & Grain bar, or GOLEAN Crunch! Honey Almond Flax cereal bar. The offer ends on February 14, unless supplies run out before then, which like most samples is likely to happen. Limited to one per household and one per e-mail address, the offer is also limited to adults 18 and up. We're all adults here, right? You can send an email to up to 5 friends telling them about this offer or track when the sample will arrive. Keep in mind that you'll have to wait one week before you'll be able to track your sample online. The sample should take approximately 4 to 6 weeks to arrive. The cool thing about samples, besides the fact that they're free, is that they usually include coupons for the same product. So, you can snack away without feeling it in your wallet or your hips! For those adults (and teens) who struggle with acne, have I got a sample for you. Murad is offering a free sample of the Acne Complex regimen, a 3-piece kit complete with Clarifying Cleanser, Exfoliating Acne Treatment, and Skin Perfecting Lotion. The sample is limited to one per customer in the continental U.S. and is said to arrive in only 2 to 4 weeks. Why, you ask? Most likely because Murad doesn't want the link going viral too quickly. But, they can't fool us for long, can they? Save an extra 30% off sale items at J Crew, 4 days only! Now that we're at the cusp of stores receiving Spring shipments, it's a good time to hit the sale racks. The beloved American retailer is marking its sale section down by an additional 30% for four days only. Save on fall and winter clothing, shoes, and accessories for men, women and children. 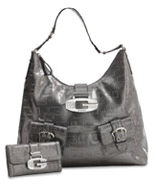 Receive the discount in stores and online from January 23 through 27, 2010. I'm not typically a big fan of strapless dresses, but I wouldn't mind adding this number to my wardrobe: The Crinkle cascade dress, marked down from $178 to $99.99, and with the additional 30% off, an affordable $69.99. If you choose to shop online at jcrew.com, use code EXTRA30 at checkout. Spend $150 or more and receive free shipping. The discount applies to sale merchandise only, but cannot be used in J. Crew Factory Stores. Have you ever tried a product line that's been around for years and years, and wondered what took you so long? For me, that's Bare Escentuals. They suddenly gained momentum this past year and started the mineral makeup trend, resulting in the company being purchased by Shiseido early this month. Ready to try it? Sephora is giving away free 10-day samples of Bare Escentuals BareMinerals foundation in stores and online. Choose between original or matte, and from 7 different shades: Fairly Light, Light, Medium Beige, Medium Tan, Medium Dark, Golden Dark, Medium Deep. The sample also includes a baby buffing brush. What better way to celebrate National Pie Day than with a free slice of pie? However, the entrée is on you. Dine at Marie Callender's on Saturday, January 23 and receive a free slice of pie with the purchase of any entrée. The offer is valid one per entrée ordered and does not include cheesecake (wah!) Okaaay, Marie Callendar's has over 30 handmade varieties, so there's bound to be something to like, even if it's not cheesecake! Oh, and Happy National Pie Day! I have to admit that I've grown accustomed to Michaels and JoAnn coupons. At any given time, you can find coupons for 40% off one item, often by doing a quick Google search. If you get lucky, occasionally the offer goes up to 50%, and now is one of those times! Michaels and JoAnn Fabric and Craft stores are both currently offering 50% off any one regular-priced item. I tend to use coupons like this on higher priced craft items that I wouldn't buy otherwise, such as tools or giant slabs of wax for candle-making. If you haven't made it to see the Tutankhamun exhibit at the de Young Museum, hurry up and get your tickets. Sure, it ends on March 15, but if you purchase tickets by January 29, you'll receive a special offer through Peet's Coffee & Tea: Buy one adult admission ticket, get one free. The discount is limited to 8 per household, and can be redeemed through March 15, 2010. Are you buying an individual ticket or afraid you might forget and miss the BOGO deal? No worries. Peet's customers will continue to receive 20% off adult admission tickets through March 15, 2010 with code TUTPEETS. Now that Spring merchandise is on its way, retail stores are emptying their racks to the outlets, while outlets are emptying racks for more shipments from stores. What does this mean? More markdowns for the rest of us! I met a little birdie the other day who mentioned working at Urban Outfitters. We discussed how difficult it must be to leave the store daily without spending an entire paycheck, and then she dropped the bomb. The clearance section would be reduced by an additional 50% starting Sunday. What?! Excitement took over about 90% of my body, with the other 10% being skeptical. No e-mails arrived from Urban Outfitters and nobody was buzzing about the sale, so I started contacting stores immediately. As it turns out, there was some sort of internal "miscommunication" because stores were also expecting this sale. Staff at both stores encouraged me that hundreds of new items have been added to the clearance section, many by 50% or more. After taking a look myself, the deals are pretty darn good. The section, both in stores and online, is organized by price: $9.99, $14.99, $19.99, and $29.99. Call me a child of the 80s, but I want a pair of BDG Cable Knit Armwarmers (above) SO bad. How can one resist when they're reduced to $6.99, from $18? It's also a good opportunity to stock up on Christmas and New Year decorations. How sweet is this Love Ornament? Even sweeter knowing that it's only $2.99, reduced from $12. It's a new year, and one way to a new you is with better skincare. Visit your local Sephora anytime in January for skincare month, with free one-one-one skincare consultations, advice, product recommendations, and personalized samples of skincare products. Each consultation is conducted by a professionally-trained Sephora beauty pro. The samples vary depending on skin type, and are based on Sephora's Four steps to beautiful skin: Cleanse, Treat, Moisturize, Protect. Hint: For a peek of what samples you might get in stores, see what online shoppers get to choose from, below. Imagine a laundry sheet that you can throw straight in the washer, transfer with the clothes to the dryer, and voilá, they're clean, soft and static-free. It may sound too good to be true, but it's not. 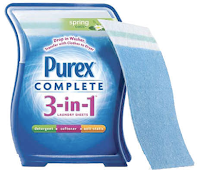 Purex introduces Complete 3-in-1 Laundry Sheets, with a load's worth of laundry detergent, softener and anti-static all in one sheet. And for a limited time, you can try a sample absolutely free. The offer is limited to one per U.S. household and takes approximately 6 to 8 weeks to arrive. What better reason for a sale than a long weekend? And what better way to buy jeans than on sale? Both Lucky Brand and Levi's are offering special savings on jeans all weekend through Monday, and they both involve a discount of 30% off. From January 14 through 18, save an additional 30% off the entire stock at Lucky Brand Outlet stores. The offer is not available online or in retail stores, and some outlet centers are excluded. Click HERE for details. To find a Lucky Brand Outlet Store near you, click HERE and select "Lucky Brand Outlet Stores." I was just thinking about how much I needed a facial, but with my budget, it's not gonna happen. Or maybe it is. Origins announces free Age-erasing mini-facials from January 21 through 24. The treatment includes a personalized skin consultation, exfoliation, and intensive moisture mask, all for free. Then, purchase any skincare product, and you'll receive a 6-week supply of Drink Up Intensive Overnight Mask or Clear Improvement Active Charcoal Mask for free. The new Aerie gift has been a complete mystery to me. That is, until I called my local store five minutes ago. Duh. Unfortunately, it's too late for this week, but there are still two more Thursdays this month! Members of the Aerie A-list receive a free gift in stores every Thursday with their punch card. This month, the freebie is a 58 ml bottle of In Love hand cream, a new scent by Aerie. Not bad for a cream that's valued at $9.50. As a member of the A-List, you'll be enrolled as an AErewards member, to gather points for rewards, receive 15% off on your birthday, and receive other free gifts throughout the year. Just sign up in store for your A-List punchcard and an AErewards card will arrive in the mail. 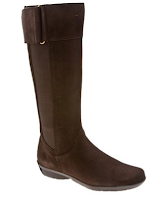 I've been keeping my eyes peeled for flat boots, especially now that they're filling up sales racks. DSW Shoe Warehouse, known for their selection of affordable designer shoes, is blowing the competition away with an additional 50% off Clearance items at DSW.com. I've got my eye on these functional and comfortable Unisa Allegra Suede Boots, originally $99 and marked down to $49.94, down to $24.97 plus tax. Of course, by the time I finished writing that sentence and proceeded to checkout, the boots became unavailable! Moral of the story? Hurry! Fortunately, DSW adds new items to clearance from time to time, so dust yourself off and try again if you're not successful the first time. The offer is available online only with code 50CLEAR, and ends on Monday, January 18. DSW also offers free shipping with purchases of $35 or more. All you have to do is become a DSW Rewards member, and use code NEWYR10 at checkout. Update: These shoes are going fast and new additions aren't showing up anymore. I'll keep my fingers crossed for more to pop up in the next few days! I'm a firm believer in DIY, and when your pocketbook is empty, I say do it yourself. The Home Depot offers weekly workshops, Do-It-Herself workshops for women, and even has workshops for kids. A few simple upgrades to your space that can be learned quickly? Painting, re-tiling floors, and upgrading bathroom hardware. The Home Depot is offering workshops in all of the above. Or should I say below? One-hour Interior Painting workshops take place every Saturday from January 16 through 30, from 10 to 11am. Learn how to prep, repair, primer, and paint walls while under a tight budget, in just 60 minutes. Stay a little longer and learn to tile while you're there (see below). The Home Depot's latest Do-It-Herself series presents Bathroom Updates, a workshop teaching women to replace faucets, shower heads, toilets and other accessories. The emphasis is on saving money by installing water-saving hardware. The workshop takes place on Thursday, January 14, from 7 to 8:30pm. With dad's birthday right around the corner, err, tomorrow, I need a gift and I need one fast. And did I mention my budget? Luckily, Borders has a coupon for $10 off any purchase of $30 or more through January 18, which gave me the perfect idea. My dad just bought the first computer that's his and his only, a brand new 27" iMac. (Lucky b-----d!) Judging by his fascination with placing his headshot on backgrounds and adding effects in Photobooth, he's more than ready to learn some other Mac tricks. My plan is to pick up a copy of MAC OS X Snow Leopard All-In-One for Dummies. No, my dad's no dummy, but I'm sure he'll get a kick out of being called one! At $34.99 with $10 off, that fits snugly within my budget. Gift cards, special orders, and previous purchases don't count towards the $30 threshold and the coupon isn't available for online purchases. Flu season is here, or as some might like to call it, The Season of the Pig. How to combat germs aside from washing your hands every five minutes? With this free sample of Gold Bond Ultimate Hand Sanitizer Moisturizer, of course. For a limited time, Walmart is giving away free samples of the sanitizer that's proven to kill 99.9% of germs, while moisturizing hands like a lotion. The formula is alcohol-free, using seven hydrating moisturizers. As digital as our lives have become, there are still times when you need to write an old-fashioned check. Now, you can keep your documents secure from check fraud, thanks to the Uni-ball line of Super Ink Pens. The pen forms an unbreakable bond with the paper so that the ink can't be erased by criminals. Even better, you can get one free! Uni-ball is giving away 500,000 of these pens through April 30, with a maximum of 10,000 per day. They hit the max half way through the first day yesterday. Anyone else get the idea they'll run out by April?! Sign up for the pen starts daily at 12pm CDT (10am PST). The offer is limited to one per person and e-mail address, and the pen should arrive in approximately 3 to 6 weeks. Where to sign up? Head to www.uniballsuperink.com every day for your chance, but get their early. Jamba Juice must know how much we like their occasional $1 Oatmeal deal, so much that they've made Wednesday the day for it. 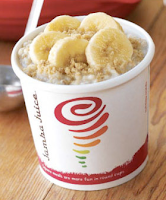 Visit a participating Jamba Juice every Wednesday through February 3, for $1 steel-cut oatmeal topped with fruit. The offer is not available at grocery store locations, nor can it be used with any other discount or promotion. Afterall, if you're going to tackle those New Year's resolutions, you'll need some energy to do it. Update! Jamba Juice has since extended the offer to Wednesday, February 24, according to their website. As for as I'm concerned, they can extend it all they want. It doesn't matter what I eat in the morning, or how early, my stomach is set to growl at 9am. There is one exception, however. A bagel with a schmear of cream cheese. I'm not sure what it is about it, but it's so tasty and filling, it can actually hold me over until lunch. Skip your daily vending machine trip for great taste and less calories. Even better, the alternate is free. During the month of January, try an Everlast Energy Bar absolutely free at any GNC location. 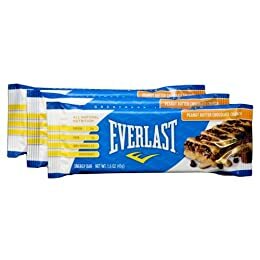 Everlast Energy Bars are a quick and delicious way to add more protein, fiber, vitamins A & C, and antioxidants to your diet. Choose between Peanut Butter Chocolate Crunch, Dark Chocolate Nut, and Oatmeal Raisin Walnut. But, get there fast! This offer ends January 31, or while supplies last, which means they could run out. Break out that disguise, this offer is limited to one per customer and no purchase is necessary. Live in San Francisco, Los Angeles, Costa Mesa, Las Vegas, Dallas, Boston, New York, or London? Pamper yourself and those fine lines with with a free trial of the new Créme Ancienne eye cream and a facial treatment at Fresh. The release will be celebrated on Friday, January 15 at 5pm, with free trials and refreshments at Fresh retail stores. Can't make it on the 15th? Call a Fresh location in one of the above cities to schedule your complimentary one-on-one Créme Ancienne Spa Experience through January 18. The Spa Experience is described as a luxurious, ultra-nourishing face treatment that's perfect for winter-worn skin. Sign me up! One of my favorite coupons has returned to Peet's Coffee & Tea. Enjoy a free beverage when you buy one for a friend through Monday, January 18. Finally, a coupon you can show from your phone! Valid at retail locations only, this offer is not available at airport, supermarket, BART, and other licensed locations. Bottled drinks, juice, and kids drinks are not included. My BFF has forever been mascara, but eyeliner is becoming a close second. What easier way to take a look from day to night, than with a swish across your lids? On Tuesday, January 5, Seventeen magazine is pairing up with Hard Candy to give away 10,000 Take Me Out eye liners in Soy. To enter, visit seventeen.com/sweepstakes/10984 and enter code "liner" in the entry form. The giveaway starts at 12:01am Eastern Time on January 5, 2010 and ends on February 8, 2010, or when supply runs out. Limited to one per person, each entrant must be between the ages of 13 and 29, and a legal resident of the U.S., District of Columbia, or Canada. 2010 is here and what better way to celebrate than with free stuff?! Allure's daily giveaways are back with prizes to the first 500 readers who sign up each day at noon EST. I had a nightmare the other night that I missed the last day for a free 3-piece sample of Aveda Smooth Infusion Shampoo, Conditioner and Style-Prep Smoother. Problem is, it wasn't a dream, it was true! Imagine my relief when I found Aveda's new offer: A free 3-piece sample of Color Conserve shampoo, conditioner, and strengthening treatment. Fortunately, this offer won't expire until June 30, 2010. What's better than a sale? A sale that's on sale. Even better? An Urban Outfitters sale that's on sale. Through January 5, save an extra 25% off already reduced sale items online at urbanoutfitters.com. Save on clothes, shoes, and accessories for him, her, and the beloved apartment. The discount will automatically appear in the cart at checkout. 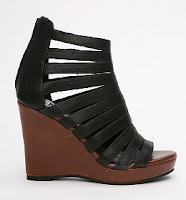 Check out the daring Jeffrey Campbell Marly Wedge (left) marked down to $79.99 from $128. With the additional sale, these platform peeptoes are only $59.99 plus tax. Plus, if you spend $150 or more, you'll receive free shipping. If a penny saved is a penny earned, now's the time to visit Aaron Brothers. Buy any frame or canvas at Aaron Brothers, and get a second frame or canvas for 1 cent, through Sunday, January 24. It's the perfect opportunity to stock up on future gifts. And if you're a photographer or painter, this sale is made for you.